This set is absolutely beautiful. The Pink Pearls are a soft pink. The necklace is a perfect size. The earrings will hang nicely on the ears. This was a gift and was well taken with delight. I recommend this purchase. This was a great buy. This elegant Miadora pearl swirl necklace and earrings set is crafted in sterling silver and features three pink cultured freshwater pearls in a diamond studded floating halo swirl design. 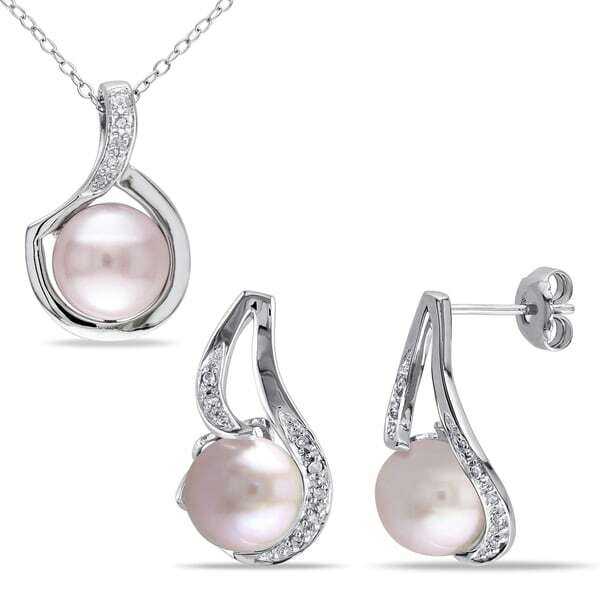 The stunning pearl set is a perfect gift for someone you love. All weights and measurements are approximate and may vary slightly from the listed information. *T.W. (total weight) is approximate. 1/10 carat T.W. may be 0.08 to 0.12 carat. Treatment code D (pink pearl) and N (white diamonds). See Treatment Guide for further information.